I would be crazy to complain about anything that happened in the garden this summer. The weather has been lovely, possibly even perfect. For the most part we had warm temperatures with plenty of rain mixed in. Sure, there were a few dry weeks, but I only had to do supplemental watering a handful of times. And yet, there is one problem in my happy little garden. And it’s a big one: verticillium wilt. It’s caused by a nasty little soilborne fungus that attacks a large variety of plant species. The ‘Lemony Lace’ elderberry looking fabulous in early summer. And it looked great until just a few weeks ago. Here’s how it presented itself in my yard. 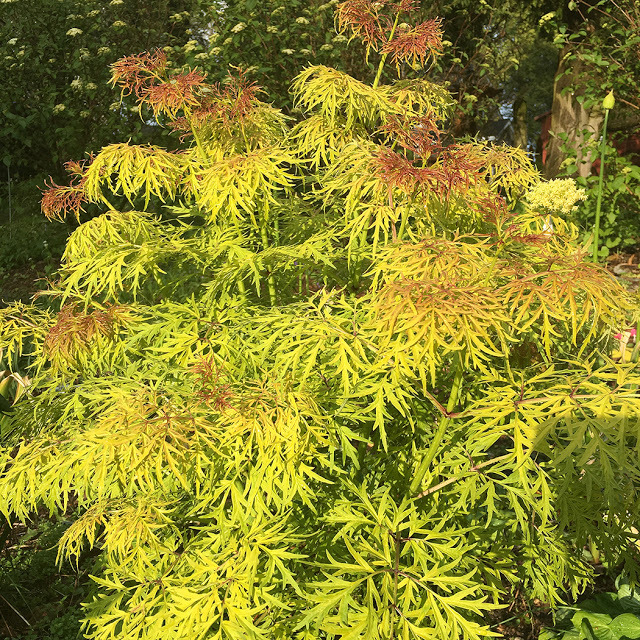 Two weeks ago my sister-in-law and I were walking the garden, taking special note of my ‘Lemony Lace’ elderberry, a lovely cutleaf shrub with bright green foliage that looks like a Japanese maple. Four or five days later, I was enjoying cocktails on the patio when I noticed from afar that the elderberry looked a little odd. Upon further inspection, I noticed that half of it was wilted. My first instinct was to give it some water. This, of course, made no sense. We’d had a good amount of rain and it was an established plant. And only part of it was wilted. It occurred to me that this may be verticillium wilt, which I’d heard of but never seen, and when I did a little research it was clear to me that’s what it was. 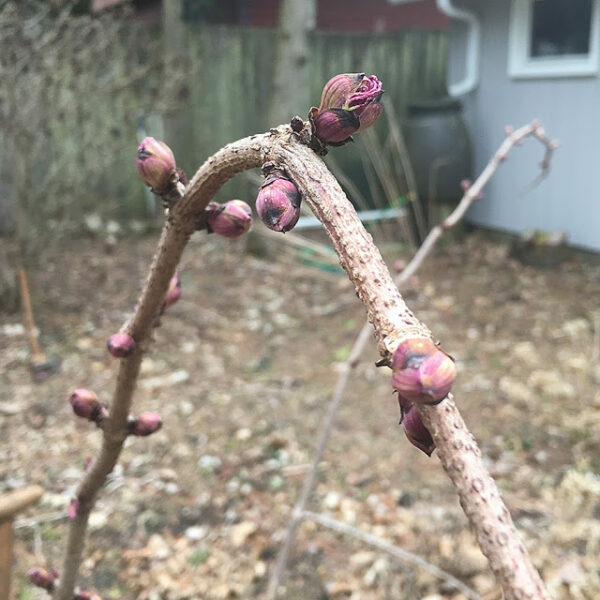 Two weeks ago I noticed that about half of the branches were wilted. About a week later, the wilted branches were brown and the leaves had fallen off. I meant to get out quickly to deal with it but I needed bleach to sterilize my pruning shears and another week passed before I could get out there. When I did, I found that the branches that had wilted were completely devoid of leaves, all of which has dried up and fallen to the ground. I don’t usually get too crazy about sterilizing my pruners, but verticillium wilt is particularly nasty and I didn’t want to take any chances. 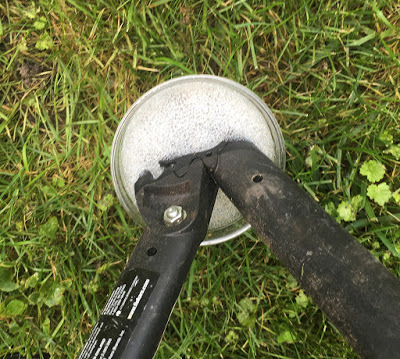 I’m not usually the most careful gardener about sterilizing my pruners, but I took no chances of spreading verticillium wilt. This was about a 10% bleach solution and I dipped the pruners in it between every cut. I cut away the wilted branches, but honestly, I’m being exceptionally optimistic. 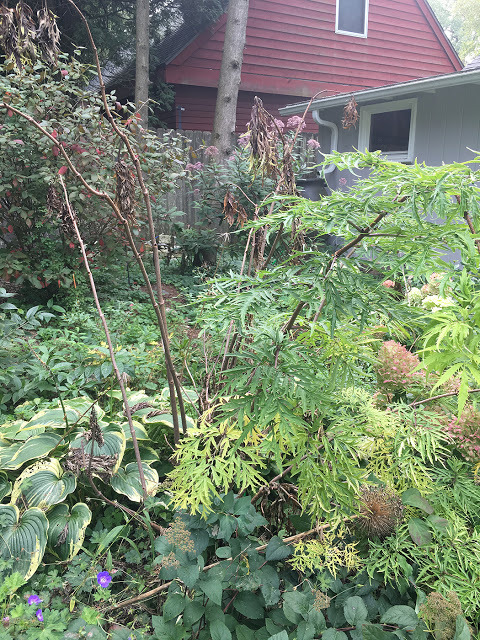 If the rest of the branches (which look a little silly now) make it through the fall, the odds are the elderberry will come back next year, look good until late July or August, and then the same thing will happen. And the more it happens, the more I risk having the fungus that causes it spread, putting other plants in danger. Elderberries are susceptible to it, but so are viburnums, which my yard has plenty of and I would hate to lose any of them. In fact the list of plants that can succumb to verticillium wilt is long. This all had to go. You can see that the leaves of the non-wilted branches are yellowing a bit, which is probably a sign that they will succumb to wilt soon. Since the fungus that causes verticillium wilt lives in the soil, the only way to get rid of it is to either remove the plant and the soil around it or to solarize the soil by digging it, wetting it down and pinning clear plastic over it to “cook” during a hot time of the year for several weeks or even months. All of which is a real drag. I loved that elderberry and it was a real star in the garden, but it will have to go. 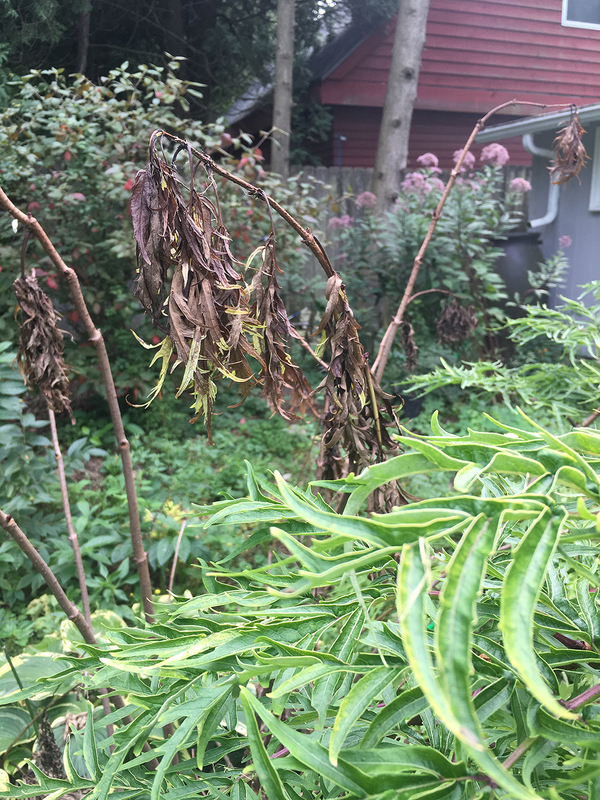 When I remove the soil, I’ll plant something that is resistant to verticillium wilt in its place and to be extra safe, I will dispose of the soil in some way that I don’t have to worry about it spreading. This may be in the garbage or possibly I’ll throw it in the fire when we have a bonfire. One last note: Waiting until all the leaves fell off was a really bad plan. I had to scour the area for all those leaves, making sure to remove all traces of them. All of the branches that I cut off went directly into the garbage. 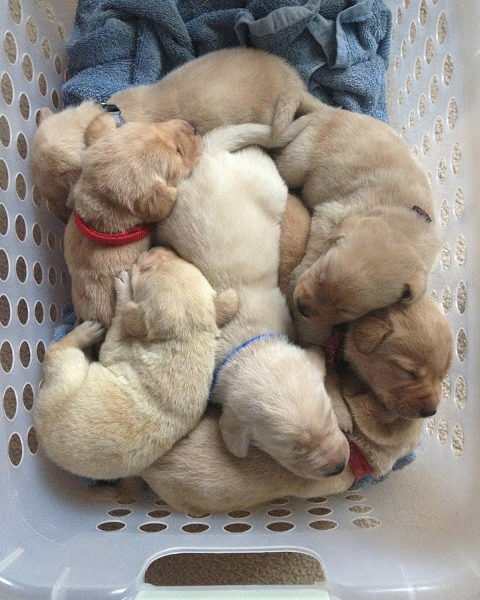 I could have burned them but it could be awhile before we have a fire and I didn’t want them sitting around the yard. I’m sad about the whole thing, but the sooner and more thoroughly I take care of it, the less likely it is to spread to other plants. 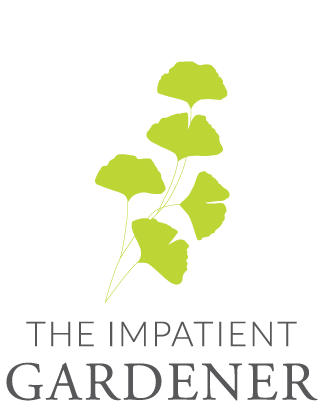 The Garden Appreciation Society Week 7 — Link up! I lost a few Japanese maples to it before someone suggested that was my problem. Have not lost the replacements: yews, box, Hostas. 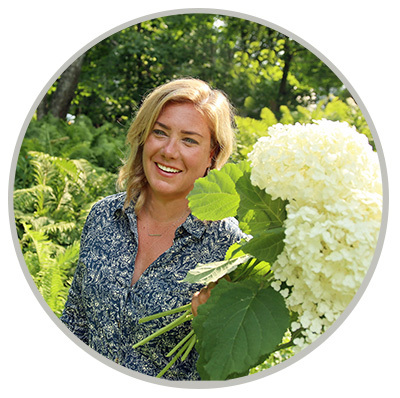 I keep a rag and spray bottle of Lysol with me and try to keep cleaning my pruners, esp. 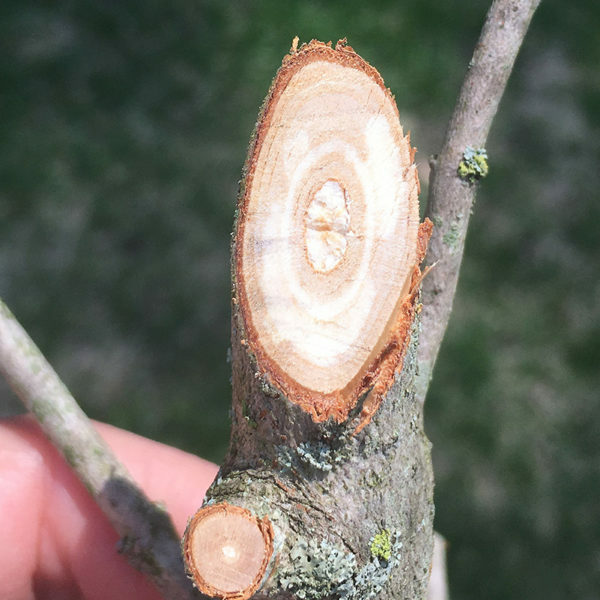 if I am trimming something that has died and I don't know why. What a bummer as that was a beautiful plant. 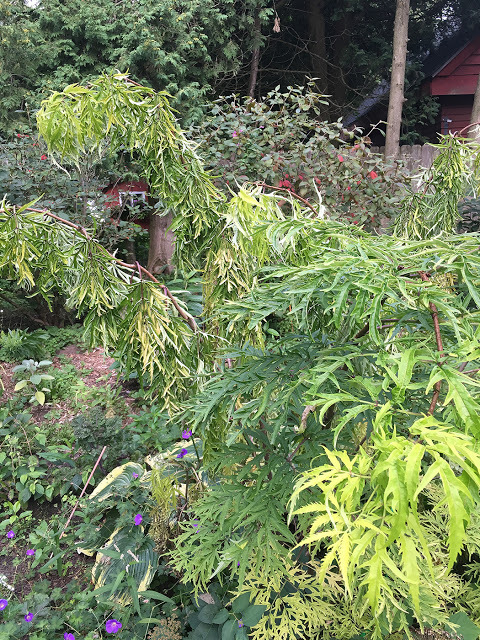 Egads … Japanese maples too? I just hope I can keep this contained to just the elderberries. That's a really smart idea about the spray bottle. I don't remember hearing about this. I hope to never have to deal with it. Good luck.